Sarah Garvin. Photo stolen from her Facebook page. If that wasn’t OK with her, I figure the worst thing that can happen is she will unfriend me and then work me to near death the next time she sees me. Everyone has heard the clichéd old expression: Excuses are like assholes elbows, everyone has them. I don’t like to get all sweaty. My knee/back/hip/arm/shoulder/finger/left heel/bottom lip/ear lobe HURTS. My athletic days are behind me. To be honest, I nearly gave in Monday to excuses. My lower back was really stiff when I woke up. Too much weekend, I guess. For a few minutes, I thought about skipping a workout at Sarah’s gym. 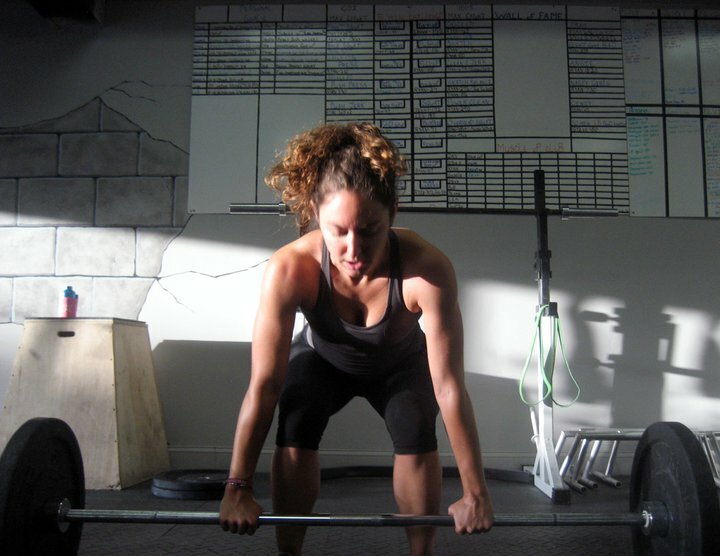 Dead lifting 185 pounds for sets of 21, 15 and nine repetitions. But then I went. And there might be a lesson in the experience for many people. I started out slowly, but then really got into it. At some point, I realized my back was no longer stiff. This realization hit me as I dead lifted more weight for more repetitions than I thought I could. When Jacob put 140 pounds on the 45-pound barbell, I thought: There’s no way I can lift 185 pounds a total of 45 times (sets of 21, 15 and nine repetitions). My back will never take it today. Instead of giving in, however, I told myself: What the hell? Try it. See what happens. And, to be honest, the first 21 weren’t so bad. I knew I would finish. This, I think, is a key to fitness and being active. How much you can lift or how fast you can run isn’t what matters. What matters is doing more, pushing yourself harder today than you did yesterday. It’s important to not give in to the voices in your head that say to take it easy, or, even worse, to give up and quit. The truth is we can always push ourselves harder than we think we can. This is something I knew before ever setting foot in a Crossfit gym, but I am reminded of it every time I go back. 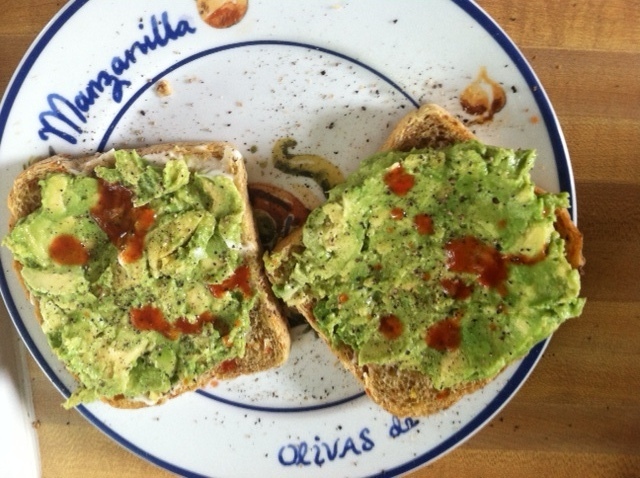 On the food front: For breakfast today, I came home and made one of my favorites from when I lived in Twin Falls, Idaho: Avocado toast, which I ate often at the Java coffeehouse. It’s very simple: Toast two pieces of bread. (I used carrot bread from New Pioneer Food Co-op in Iowa City.) Mash up an avocado, spread it on the toast and sprinkle with cracked, black pepper. I added a couple of splashes of Sriracha sauce because it tastes good on almost everything. I keep telling my friends at Elly’s Tea & Coffee that they need to add this to the menu. My goal is to convince Elly about this before I can do handstand push ups at Warrior Crossfit. And I have patience and determination on my side. ← Is it really Friday already?